Tons of new features and developments have been announced during HubSpot's Inbound 2017 convention held in Boston last week which gathers HubSpot employees, partners, users and inbound marketing enthusiasts. The event comprised of keynotes and sessions of the latest trends and developments in inbound marketing and digital marketing and even featured several featured speakers such as Michelle Obama, Alec Baldwin, Martha Stewart, Chelsea Clinton and John Cena as well as several influencers both within and outside HubSpot. However, one of the most awaited moments was the presentation of the latest updates and new upcoming features of HubSpot's platform. 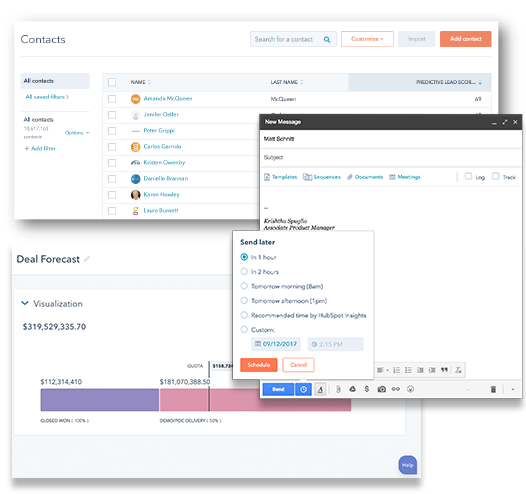 First off, HubSpot's Sales Hub Professional will now include elements of automation, predictive lead scoring, smart email templates, document tracking, automated meeting calendar, web chat, automated email sequences, advanced deal and task automation tools, team management, custom dashboards and more reporting features. These new features are expected to further empower sales teams as it saves time and allows the team to work more efficiently. It also allows them to connect with the right prospects and help them build and easily manage a sophisticated sales process. Finally, it also helps them analyze sales performance and see which actions benefit them the most. These new features will certainly be a boon for Inbound Sales practitioners. These new features will be available starting the 1st of November. 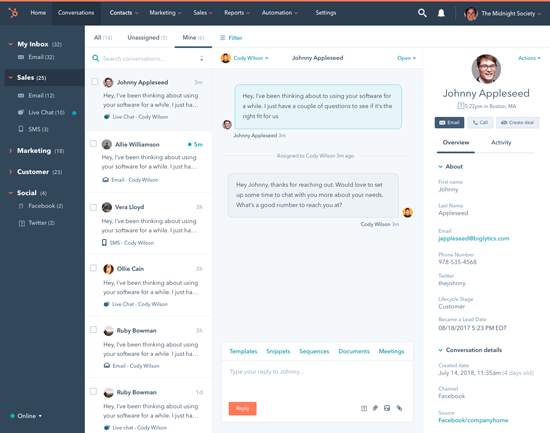 HubSpot also unveiled Conversations, a shared inbox that helps your team to better engage customer with one-on-one chats. With a single place to view, manage and reply to prospects and customers chat's from different sources, it removes the need to hop from one platform to another to manage messages. 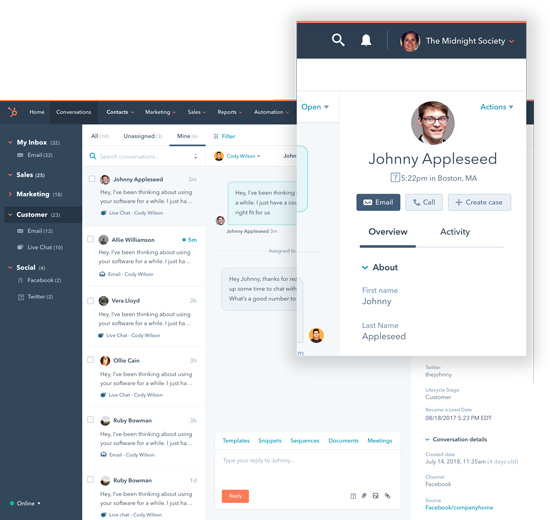 It comes as a new feature of the HubSpot CRM Free, making the feature freely available for all. HubSpot Conversations can manage chats from Facebook Messenger, on-site chat, social media, email and other messaging platforms. These interactions, since they will come natively with HubSpot CRM Free, can be accessible in the insightful Customer Timeline. HubSpot has also taken into consideration the possible increase in workload when making instant chat available for all visitors. That's why one of the things that makes HubSpot Conversations so easy to manage are its automation rules and bots that will allow you to automate conversations especially for simple questions. The recent acquisition of Motion AI is expected to power HubSpot's new chatbot capabilities which are expected to be rolled-out by early 2018. HubSpot will be strengthening the customer service component for its users through its new Customer Hub. Built on top of Hubspot Conversations, it makes it easier to escalate a regular chat into a case that can be managed. Feedback and insights tools can now be deployed across the Conversations functionality as well as in email and many more. It's not just about solving tickets but its aimed at helping customers with efficiency and speed through knowledge center tools. This is expected to be released in 2018. 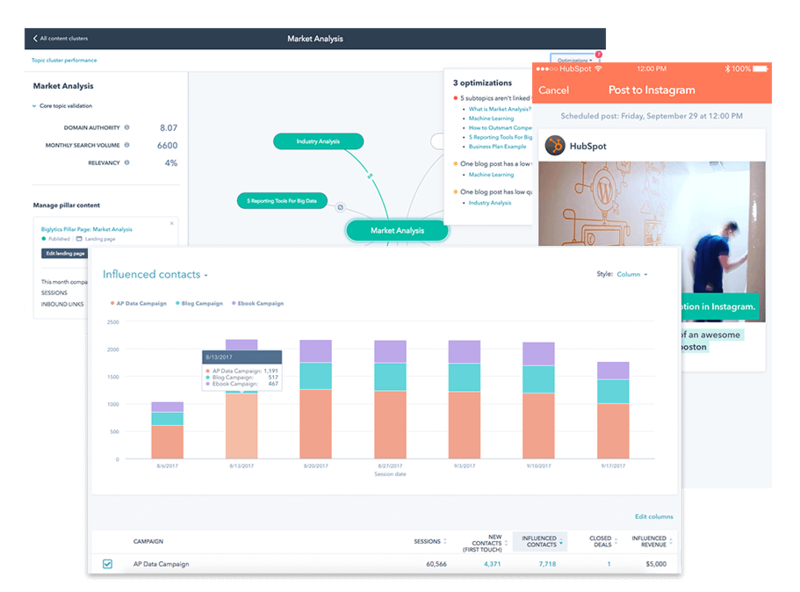 HubSpot's Marketing platform is getting a boost with a lot of new features that are designed to organize and make content work better. First, they introduced Content Strategy which allows marketers to get more traffic with less content by changing inbound marketers' approach to content and SEO. Campaign Reporting will also allow you to attribute even the components of broad marketing campaigns to your results allowing it to compute for ROI on blogs, social media activities and more. Through HubSpot Marketing's new Facebook Ads functionality, you can use HubSpot's segmentation tools to create targeted ads on Facebook. Borrowing from the increasingly popular concept of account-based marketing, this will allow you to show ads to your leads' coworkers and those in their circle to further influence those targets. It also allows direct conversion on social media platforms through Facebook's Lead Ads even if these prospects haven't visited your website or blog yet.